I'm not so much of an expert on guitar albums. So I won't draw any comparisons to any other solo guitarists throughout this review. In fact, I think I won't be able to, because Alien Stole My Whiskey is such an enjoyable album that it stands on its own just by sheer energy and creativity. From the get go, Alien invites the listener with the enticing Blood of Raven. Calm and collected, almost ambient. It's obvious that it is just aural foreplay for the next track which is a total firecracker. An Ancient March With The King's Pipers is an epic instrumental piece. 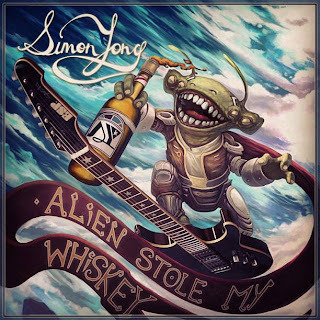 Mixing all sorts of instrumentation and effects, Alien Stole My Whiskey is far more than just a guitar wankery showcase. In keeping up with the theme of continuity of the album, Seismic Waves picks up where Ancient March left off. Exploding with an intro riff and sweeps you off your feet with its melodic goodness. Violins, keyboards, pianos, drums and bass plays almost the same level of prominence on this album as guitar. Each having a beautiful spot in the mix to blend and weave a blanket of sound. Seismic Waves, The Gardener and Listen To The Sun are perfect examples of the aforementioned fusion of instruments. Melodic and precise, Simon Yong knows what he is good at and takes no time to flaunt it. As enjoyable as this album is, Kyra got me bored after all the flexing in the album. It does serve its purpose to show the more delicate side of Simon's chops but it feels abit disjointed from the overall theme that seemed to be going on with the rest of the album. And the fact that this sounds like the obligatory track that every solo guitarist album has to have, has got me neither amazed nor disappointed about it. In short, too typical and breaks the flow of an otherwise intense album of riffs and build ups. Alien is an amazing guitar album that deserves to be listened to by guitar enthusiasts as well as music lovers alike. The songwriting keeps you glued from start to finish and the musical prowess of everyone on the album maintains a level of badassery that many wished they possess. Sure, there are rough edges here and there, and it could have been made better but it also makes Alien a far more personal album by bearing its flaws.